This sign is authentic and is not a reproduction. It would make a great addition to your sign collection. Here is some information that I received from a fellow e-bayer. WAS ONE OF 4 MEN WHO STARTED STATE AUTO INS. MY FATHER WAS AN OFFICER OF THE COMPANY AND ON THE BOARD OF DIRECTORS. I WAS THE MAJORITY OF THE MINORITY STOCK HOLDERS AFTER TEXTRON BOUGHT OUT ALL THE SHARES FROM MY UNCLE AND THE 3 PARTNERS AROUND 1960. THERE WERE ONLY 1000 SHARES ISSUED IN THE ENTIRE COMPANY AND I OWNED 17.5 SHARES AND MY BROTHER AND TWO COUSINS EACH OWNED 7.5 SHARES EACH. MY FATHER WORKED THERE 22 YEARS BUT NEVER OWNED A SHARE OF THE COMPANY. YOUR SIGN IS QUITE INTERESTING AS A LARGE PORTION OF THEIR BOOK OF BUSINESS WAS ANIMAL HAULING TO FEEDLOTS AND MEAT PROCESSING PLANTS. IT WAS QUITE MORE RISKY BACK 50 YEARS AGO BECAUSE WE DIDN'T HAVE THE ROAD SYSTEMS WE HAVE NOW. FREQUENTLY TRUCKS OVERTURNED ON ICY ROADS OR WENT OVER BRIDGES WITH CATTLE, ETC. MY FATHER WAS UNDERWRITING DIRECTOR/MANAGER OF THE COMPANY AND WAS QUITE GOOD AT DEVELOPING RATES FOR THE TRANSPORTATION OF ANIMALS, DYNAMITE. HE ACCEPTED RISKS THAT MANY OTHER COMPANIES WOULD TURN AWAY BUT CHARGED A FAIR PREMIUM FOR THOSE TYPES OF BUSINESSES THAT HAD UNUSUAL EXPOSURES. I WAS 16 WHEN AND SURE DON'T MISS THE WINTERS IN IOWA! GOOD LUCK WITH YOUR SALE OF THE SIGN. FRED IN TEXAS AT THE RANCH. It measures 12" x 12" wide. Good condition for its age. It has some moderate to severe scratches, dents and discoloration, see pictures. See description above for further info on the condition. 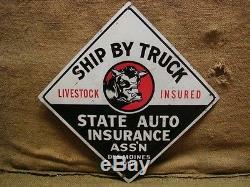 The item "RARE Vintage State Auto Insurance Sign Antique Old Iowa" is in sale since Sunday, October 17, 2010.